Here are some custom Christmas stockings that I've knit with Christmas tree pictures on them. The Christmas tree tradition goes back many generations, and the shape is ideally suited for knitting. A Christmas tree picture works well on a red or a white background. It also looks very nice against a blue background for a more natural style. 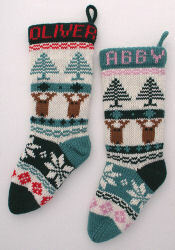 Please look to see what Customers Say about stockings I've knit with Christmas tree pictures. This tiny tree is beautifully detailed without looking too cluttered. It looks like the teddy bear may have been playing with the decorations! While this tree is a common size and shape, it's unusual in that it's decorated with simple yarn knots. This is a wonderful idea for folks who don't care for sequins. This is a wonderful old design, shown in 3 views so you can see all of it. The details in the shape of the tree and on the various toys make this stocking difficult to knit, but the finished result is a treat. The angled name banner nearly disappears on the back side. It's quite unusual, and is nicely echoed in the slight tilt of the tree trunk. This tree can be seen with much less ornamentation below. The design is actually very detailed even before decorations are added. 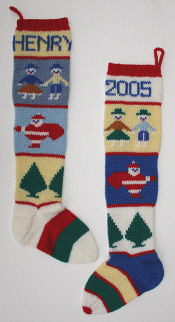 This stocking and the previous one were decorated to match the family's other stockings. This unusually detailed tree is larger than most and quite beautiful. 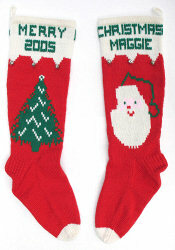 It could be used alone or with the original Santa face on the reverse. The same design, with a few differences. The green-on-green turned out very nicely. The white "snow" is done in angora for a bit of texture, and red beads are added. The white at the foot represents the ground. The "46" is the recipient's birth date. 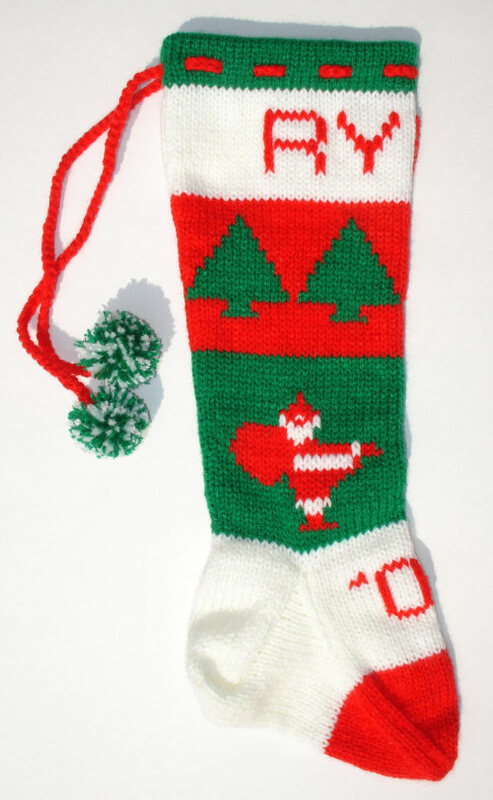 To fit the size of this customer's stocking, I had to create a more slender version of the tree in the previous photos, without sacrificing any height. This tree borrows the idea of snow on the branches from the larger tree in the previous photos. A classic 3-stripe design, with pictures chosen for the customer's grandson. The small tree is brightened with sequins. A tree cut from felt is decorated with sequins and beads, then sewn onto a plain stocking. The highly decorated tree next to the house has a partner on the other side of the stocking. They are part of an unusually elaborate design. The simplicity of this design is particularly beautiful in the old-fashioned colors. 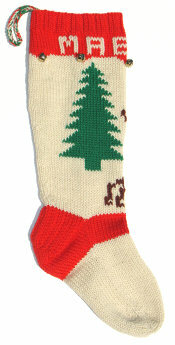 This unusually large tree shares the stocking with a reindeer that appears to be running away. Such a large tree could easily be decorated if desired. These trees are quite a bit more realistic than many. They add perspective to the main figure. This stylized tree could be knit with the pot and the star on top in different colors. Some more realistic trees. These also add depth and perspective to the main focus of the design. This Christmas tree is woven with a white yarn that contains a silver thread. The star is embroidered. The classic Christmas tree shape can easily be made taller or shorter, with some adjustments to the angles on the side edges. This one is trimmed with a gold star and a red garland. The classic triangle tree done skeleton-style. These Christmas tree pictures are very effective on a white background, but they probably wouldn't show as well on another color. They could easily be made larger or smaller. This small tree could fit in with many other designs. 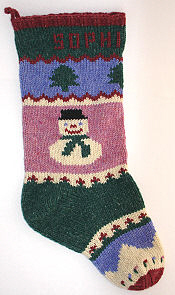 In this stocking, it's embellished with multi-color star sequins. A small tree with an unusually irregular shape. I would have spaced these Christmas tree pictures closer together, so that two full trees showed on either side. I was copying an existing stocking here and didn't want to take liberties. This very simple tree lends itself to decoration. The white yarn with silver thread mimics sparkling snow. Other types of decoration would also work well. A small tree on the back of a Santa stocking. It could be larger or smaller. On a large one, it would be interesting to make the ornaments different colors. A classic triangle tree embellished with hand-sewn sequins. This one has very nice proportions. This was knit from a customer's pattern. She planned to embellish it with sequins, pompoms, and gold cord to add bows to the gifts and ornaments to the Christmas tree. This Christmas tree picture is included in some old stockings that I was asked to duplicate. It is a basic triangle tree, but the bottom is rounded. This softens the lines and creates a more realistic effect. If you're interested in a stocking with a Christmas tree picture, find out more about ordering custom Christmas stockings.